This pewter trinket box features a heart shape that is enhanced with the Irish Claddagh symbol. This Irish trinket box features lead free pewter construction along with the Claddagh on the lid. The Claddagh trinket box is heart shaped and measures 3 3/4" x 3 1/2" x 1 1/4" tall. 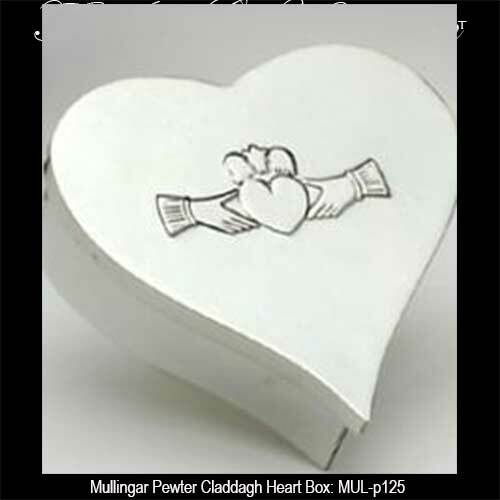 The Irish jewelry box is made in Ireland by Mullingar Pewter and is gift boxed with a Claddagh history card that are complements of The Irish Gift House.